Last week we addressed how ‘man’s politics’ have had a destructive influence on our society. It has taken ‘freedom’ and twisted it into an evil word to be used to justify just about anything and everything. ‘God’s politics’ gave us freedom but with restraints to protect us from the debt sin places on us when the restraints are violated. Just ask Adam and Eve. When God created humankind He did not just make a class of animal composed of atoms and molecules but fashioned a creature made in His image and likeness…a creature with a soul, an intellect, and a free will. [Genesis 1:26]. He fathered a race of beings who are part physical and part spiritual and who have the ability to make their own decisions…to choose between good and evil. Unfortunately we’ve seen crimes committed throughout history and even in the present day that are so abominable that it ‘curdles the blood’ to think about them. There have been mass murders, tortures, genocides, and infanticides. Spiritual pride and spiritual evil does exist. It’s possible not only to choose evil but to love it and hate all that is good. In many cases ‘man’s politics’ has legalized these acts and people have fallen right in line accepting them. When a large segment choose to rebel against God under the leadership of the ‘godless’…Satan, Lucifer, the Devil…’man’s politics’ can become a curse that can have incredible significance and ramifications today and generations to come. Could it be that is what we are experiencing today? Having rebelled against the Creator, atheists blame God for their miserable state. They hate Him with all of their being and want nothing more than to lash out at Him and hurt Him in some way. That is the nature of spiritual pride. It breeds disobedience and hatred and a desire for revenge. But how can they hurt God? He is all powerful and invulnerable to any kind of conventional attack. There appears to be just one option. If you can’t hurt God directly, your only course of action is to try to hurt that which bears the image of God. You try to hurt those weak and wounded creatures known as human beings. From the time the serpent tempted the first humans in the garden of Eden, dark spiritual forces have attempted to trick, deceive, injure, humiliate, mock, and murder human beings. Recent events in history…1930’s and 1940’s…exposed how a Christian nations such as Germany was duped into murdering millions of humans…men, women, and children…because of their ancestry. They were able to be convinced it was the right thing to do. Then when their actions were brought ‘into the light’, evil tried to convince them that they really didn’t know such acts were taking place. It was not their fault. Unfortunately many churches stood by and let it happen and said nothing…not wanting to ‘offend’ their evil leaders. Those who did speak up and take action in many cases joined those who were murdered. Even today Christianity is having difficulty recovering in Europe. The strategy of those who hate God has always been the same: to use deception to convince human beings to abuse their freedom (constitutional freedom? ), to make them believe they can have all the power they want if only they will disregard the will of God. Without God, humans are free to act and react as they feel, after all they have made themselves into ‘gods’. The Bible, says that God is the “Alpha and the Omega, the First and the Last, the Beginning and the End.” [Rev. 22:13]. But in our times today, the Devil mocks God and says “No, I am the beginning and the end. Through abortion control I control when life begins, and through euthanasia I control when it ends”. Four words used by God to teach mankind the meaning of love are also used to promote the killing of unborn children. “This is my body, which is given for you,” Christ said to His disciples the night before He died. [Luke 22:19]. He spoke these words in order to demonstrate how sacrificial love has the power to save the world and give life to others. This is the same expression abortion supporters use to justify their pro-death views. “This is my body,” they say. “I can do what I want with it, even to the point of killing the life within me.” [Frank Pavone,”This is My Body”, Priests for Life, April 29, 1997]. The same words are used to support and deny life…and ‘man’s politics’ supports that denial. As we will see in the coming few weeks ‘man’s politics’ starts out in many instances with good intentions but then because ‘God’s politics’ are ignored the results become disastrous. At the center of Christianity is the concept of repentance. Repentance simply means being sorry for sin; being sorry for sin entails turning away from evil and back to God. Repentance represents a reversal of the sin of pride. It is an undoing of our rebellious nature and a sign of true faith. Christians believe that God has made repentance easy for us. All we have to do is ask for forgiveness with sincerity…and He will grant it. The Devil understands the concept of forgiveness, too. He is aware that his temptations may be thwarted with a simple last-minute apology. His whole strategy must turn on something else in an effort to ensure that the person he is tempting doesn’t repent in the first place. Atheism destroys the very possibility of repentance. After all, if you don’t believe in God there is no one to apologize to. Why say you a sorry when no one is listening? Atheism fosters an attitude of moral relativism. This says that because God doesn’t exist, there is no such thing as objective truth. Humans are free to make their own rules and dispense with Biblical commandments. So if sin doesn’t exist, why apologize. It has often concerned me when I find that a politician in a leadership position is not a Christian. If that’s the case, who is this politician accountable to behind ‘closed doors’? If he/she makes up the rules, who’s to say that they feel no compulsion to represent the people who elected them? 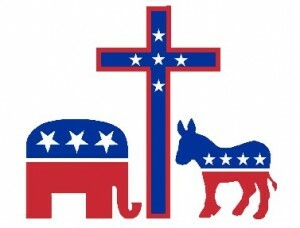 While our Constitution does not require a ‘religious test’ for leadership, I believe it is important to know where the candidates stand…thus the value of voter guides. For those who subscribe to moral relativism… thus no need to repent of sins because they don’t believe they can sin to begin with…sin doesn’t exist in their ‘world’. Atheists act as accomplices to evil in three primary ways…first, by working to bring about the actual physical deaths of human beings; second, by creating an atmosphere of hopelessness that leads to despair and unhappiness in this life; and third, by strangling any impulse people have to faith and repentance, thereby destroying their hope for happiness in the next life. Next week we will look at how ‘man’s politics’ with its ‘good intentions’ is destroying lives and undermining our society. ‘God’s politics’ gave us a way to live responsible, productive lives and ‘man’s politics’ has come along with a ‘better way’. Such an approach fails every time.